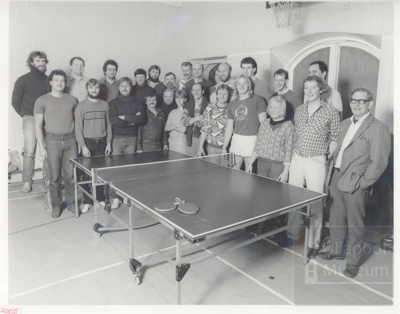 About this objectLocals versus Eastern Europeans at table tennis. Table tennis tournament break. The Eastern European processing ships came to Ullapool every year to buy and process British-caught herring and mackerel. Up to 50 vessels moored in Loch Broom and the crews came ashore for rest and relaxation. The Drill Hall in Ladysmith Street was originally built by the Territorial Army and used by the 4th Seaforths. At the time of writing  it is used by various youth groups and is in the ownership of the Highland Council education department.